1. 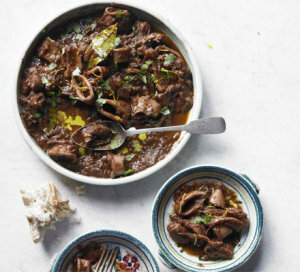 Heat the olive oil in a shallow saucepan or flameproof casserole and add the squid, onions and garlic. Add the dry ingredients and simmer until all the liquid has evaporated and the onions are tender, about 15 mins. Add the vinegar and chopped tomatoes, simmer for 1 min, then pour over the red wine and season. Simmer very gently on the lowest heat, stirring occasionally, for 1 hr or until the sauce is rich and the squid is really tender. 2. Turn off the heat, leave to cool slightly, then drizzle with a little more olive oil and scatter with the coriander and orange zest. Tip: If you like the dish slightly more spicy add 150g diced spicy Chorizo during step 1 to give the dish a richer and more Spanish flavour. 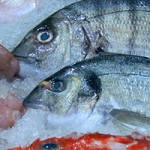 There are over 20,000 MSC-labelled products on sale around the world, from prepared seafood meals to fresh fish from the seafood counter. 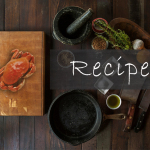 Find out more about how to cook, eat and enjoy each of these different seafood species, certified sustainable when carrying the MSC ecolabel. Look for the MSC Eco label! 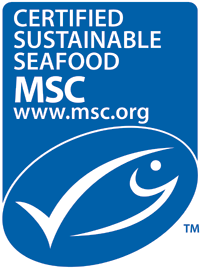 By looking for and choosing the MSC Eco label when shopping or dining out, you can enjoy eating any of these species safe in the knowledge that it has come from a certified sustainable fishery. 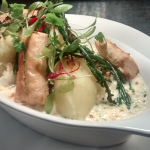 Today’s dish of the day is a rich seafood pie using Salmon, Scallops, Hake, Haddock and cockles. Slowly poached in a rich white wine and cream sauce. Topped with creamy Horseradish mashed potato, Puff Pastry and a parmesan crust. The perfect winter warmer on a damp November Evening.